This is the self-published story of a Colonial Agricultural family, moving from Scotland to Sierra Leone, Uganda and Mauritius and finally to life as a freelance tropical agricultural consultant. I particularly liked the novel idea of the introduction to the MacDonald and McAndrew clans. It also has a more sombre theme, the struggle and hardship and the courage needed to bring up a daughter with cystic fibrosis. Having myself been born in Kenya and having lived in Uganda as a Colonial Administrative spouse at about the same time as the MacDonalds, I am well able to identify with their Uganda story. I was also particularly intrigued by the contrast of their time in Sierra Leone. It is difficult for pampered East Africans to believe that life for expatriates can have been so primitive in the West Coast as recently as the early fifties. 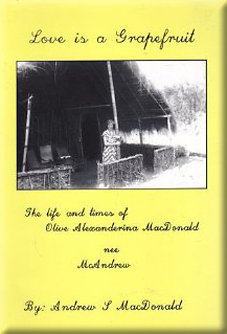 The story, which focuses on Andrew MacDonald’s wife Olive, carries you along and is written in the family anecdotal style that is typical of this genre. The trouble, as the author himself acknowledges, is that when you came on leave, bubbling with enthusiasm and ready to impress with exciting accounts of life in the tropics, no-one was much interested. And the same is tme of the books that so many of us have written since. To those of us who have served in Africa, these books strike a warm and familiar chord. Sadly, Joe Public is apt to find it all less intriguing.